Dessert is one of my favorite ways to introduce people to a pure vegetarian diet. Sweets are always quick to win over even the most seemingly unshakable of omnivores. If you really want to make waves, keep your after-dinner treats’ pure veg status a secret until everyone has devoured theirs and asked for seconds! Chocolate Banana Bites are simple to make, and rewarding because they’ll definitely turn heads. 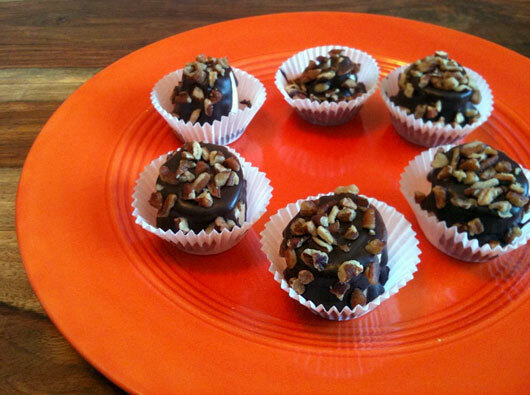 I sprinkle chopped pecans over them and serve them chilled in mini cupcake holders. These cute little confections are always a big hit at Spring parties and get-togethers. Make the chocolate sauce: Place a small saucepan over medium-low heat. Add the almond milk and stir continuously until just about to simmer. Remove the saucepan from the heat and stir in the chocolate chips until smooth and combined. Stir in the agave nectar and set aside. Make the banana bites: Spread 24 mini cupcake holders out on a cookie sheet. Peel the bananas and chop them into 1-inch pieces. Place one banana piece in each cupcake holder. Drizzle with homemade chocolate sauce until coated and then sprinkle with chopped pecans. Place in the freezer and chill for at least an hour or two, in an airtight container, before serving.